Nankai Plywood Co., Ltd./Misawa Homes Co., Ltd./Matsushita Electric Works, Ltd. Delicately angled wood frame of which width 10cm surrounds the center light fitted with creamy acrylic cover and sets this product to the ceiling. Ideal comfort is attained by combining thin steady wood frame and elegant acrylic cover. 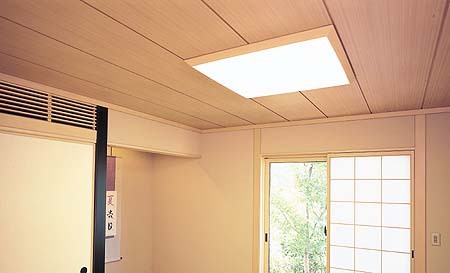 Because it is never a strong light still bright enough for residential space, this product is suitable for traditional Japanese interior and also that modern with flat ceiling.